I know in my last Soundtrack of My Life post I said I would write about Jazz, Classical and Show Tunes next, but after getting home from seeing the movie, Pitch Perfect, I feel the urge to reminisce about the a cappella songs from my college years. 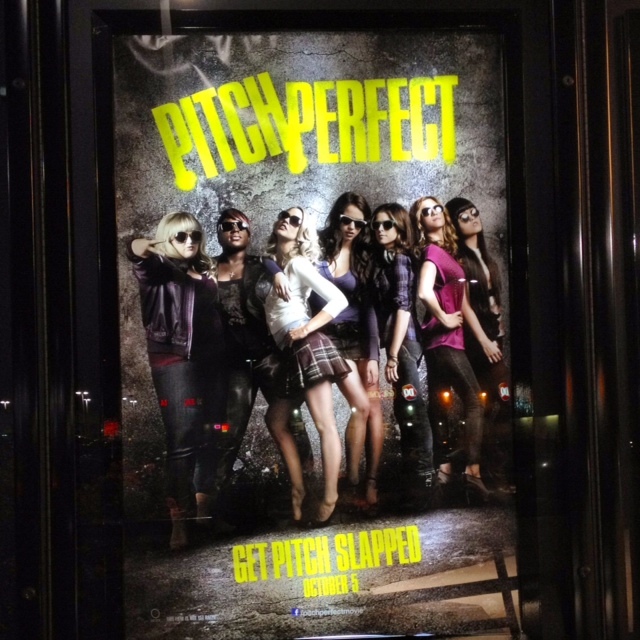 In the movie, Becca (Anna Kendrick) joins an all female a cappella group who competes against a rival male a cappella group in the International Championship of Collegiate A Cappella (ICCA) - [yes, this is bonafide event with the final competition performances in Lincoln Center - just as portrayed in the movie]. The whole premise of a cappella in a movie is what attracted me to see it, but the movie is hilarious, too. Oh yeah, the singing is fabulous! Twenty five years ago, college a cappella wasn't nearly as popular as it is now (which means it was probably REALLY low on the activity food chain), but it was a fun, creative outlet for me. One Tin Soldier - a song about about peace, not war - was one of the first songs I learned. The chord at the very end of the song is just so nice. In high school, I sang in the Jazz choir, so I love that genre. Add in the premise of heartbreak and you have the torch song. Scotch and Soda is one of those smoky, old fashioned songs that is a perfect torch song. It doesn't hurt that the soloist here has the smoothest voice ever. The arrangement is from the late 70s, but I pulled out the song for our group to perform because I wanted a chance to sing the solo during rehearsal. I discovered The Manhattan Transfer in High school (again, in jazz choir). I thought it was cool for a quartet of voices to sing old songs like Tuxedo Junction, Birdland and Route 66. We sang this song when I was a senior and it felt like an old friend. Finally, the song I remember the most - you tend to remember your first featured solo. I wish the recording was a little "tighter", but hey, we had limited time in the recording studio - things were a little harder to mix back in the analog days. If I had more time, I would love to sing in an a cappella group again - there are so many cool arrangements now and the addition of beat boxing (my friend and fellow song mate, Wes Carroll was a pioneer in the use of vocal percussion in a cappella music) adds another dimension to the art of the vocal rock band. I highly recommend any singer with musical aptitude to audition at their local high school or college - there are so many groups now and it is such a great activity. I remember being persuaded to audition (Phil Budne - you were the convincing one) and it was the best things I ever did in college. The previous entries in my Soundtrack of My Life series can be found HERE. The next entry will be Classical, Jazz and Show Tunes faves from High School - yes, I am a music geek, but you've probably noticed that already. This is absolutely positively so cool. I sang (a lot) in high school...probably in every singing group they had. The biggest honor was getting into the B-Naturals (blue blazer and all) and then being chosen to be in Sr. Trio (when I was a Jr.) Ahhhhhh, memories of music. Thanks for these memories!